Five hours into the play, China’s Jun Wang emerged victorious at the 2018 WSOP International Circuit $500 Opening Event pocketing AUD$112,171 (~$82,558 USD). Entering the final day with the biggest chip stack, Wang defeated Malcolm Trayner in a heads-up to achieve the position. Receiving an impressive 1,444 registrations, the event crossed last year’s numbers. 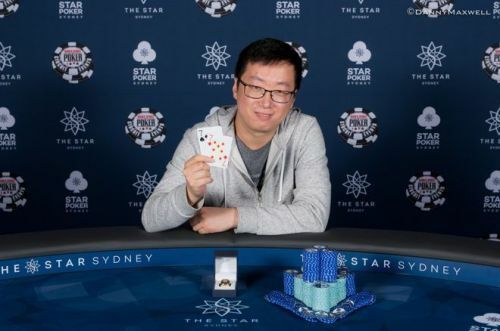 The top nine players included tournament grinders George Mitri, Chu Ong, and Alex Falon along with poker pros Chad Awerbuch and Zhi Ma who enjoy combined tournament earnings worth $700,000. Wang said that he is accompanied by his girlfriend, who has won more than him. Watching him enter the final table brought her to tears. He further said that this is in fact “my first final table”. On asking about his plans for the tournament, he said that he has “won a ticket to the $5k Challenge event” and if things went well he would play in the main event. However, if the $5k did not work out, he may play the PLO event as this is his “preferred game”. The initial phase saw Zhi Ma going all-in in the very first hand. He had ace-king against Malcom Trayner’s queens. The flop favored Trayner as another queen rolled out but eventually Ma’s hand dominated with runner-runner straight cards. As the game intensified, Trayner found another prey called George Mitri. Having ace-jack against Trayner’s ace-queen, Mitri finished his game securing o9th position. This elimination had a domino effect on the table and multiple players came tumbling down namely Chad Awerbuch and Alex Falon, securing 8th and 7th positions respectively. The Falon bluffing against Wang and getting busting trend was taken forward by Chu Ong. He hit the rails when Wang flopped the nuts with ace-four where he had a nine-high. Day 1C chip leader Johnathan Hargrave saw his doom when Zhi Ma had ace-queen while he held ace-seven. He secured fifth place and collected his first ever cash in a live tournament. Right after the first break, Trayner went on an elimination spree and busted two players simultaneously namely Shan Jiang and Zhi Ma. Holding pocket kings against Jiang’s queens and eliminating Zhi Ma later, Trayner entered a heads-up play with an impressive lead. Trayner earned dominance in the heads-up against Wang and this was true for some time until Wang doubled up. The game went to and fro from then on. Trayner open shoved in the final hand when Wang opened from the button. Wang then decided to call after brooding for a minute. Risking with king-seven against Wang’s pocket sevens, Trayner went ahead with caution. The eventual rounds could not roll out anything significant in favor of Trayner, who was about to win his first WSOP Circuit title.